A sumptuous breakfast and we depart Akaroa. The journey out seems so much nicer than the journey in, exhausted as we then were. The road over the hills of the Banks peninsula is a pleasure to drive. 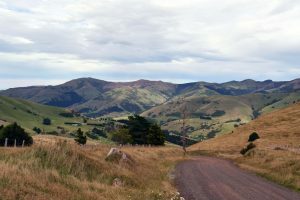 Sheep graze, lovely views abound and we are sad to leave such a picturesque part of NZ, but leave we must as today’s drive, all of another 400-ish km, takes us south down Highway 1 to Dunedin, the southerly-most point of our odyssey. We seem wedded to Highway 1. 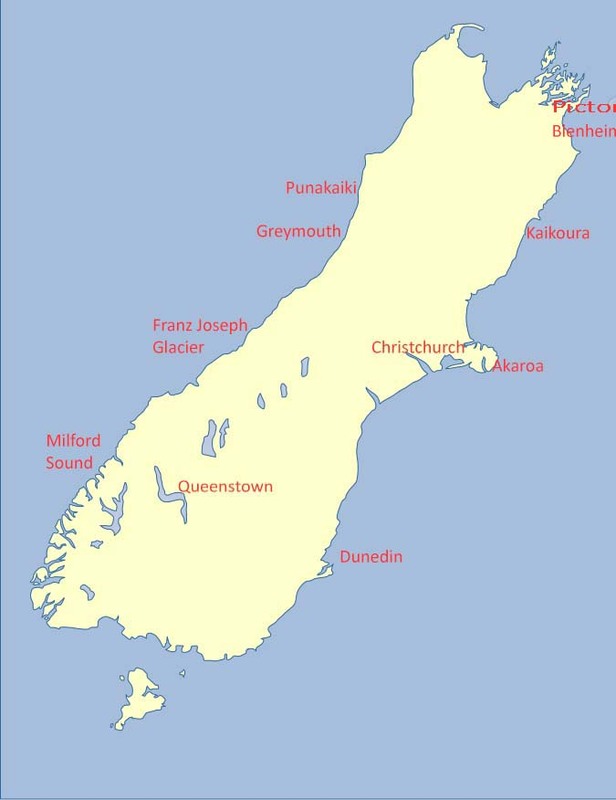 There are others, I promise, but this one is the back-bone of both North and South Islands and runs right down the eastern coast. There is little to report of this leg of our journey other than that David amuses himself burning fuel at every overtaking opportunity. Why? Because he can, and because gets bored by the back of the vehicle in front. The national speed limit is 100 km/hr. Tell that to David! We pause at Oamaru, a once prosperous little port town whose public buildings and water-side warehouses are stoutly constructed from the local white-stone, imposing and well-preserved in the mainly neo-classical Victorian style. There must have been a confidence in the future about when these buildings were erected for their fronts have monumental insets proclaiming that they are “McMurphy’s Wharf” or “Wool and Meat Export”, “City Library” and so on. Clearly no one ever expected a change of ownership or purpose. Its broad main street is predicated on the turning circle of bullock carts and it was a thriving export centre of meat and wool. Oamaru must have over-reached itself, for by the end of the nineteenth century it was teetering on bankruptcy. Fortunately there was little incentive to swing the wrecking ball with the same enthusiasm that wiped out much else of the built heritage of New Zealand and Oamaru is now a cute collection of small shops, bars and restaurants with a mildly bohemian air. It reminds me of London’s Portobello Road in the 1960s. Down there, there is one. See him? 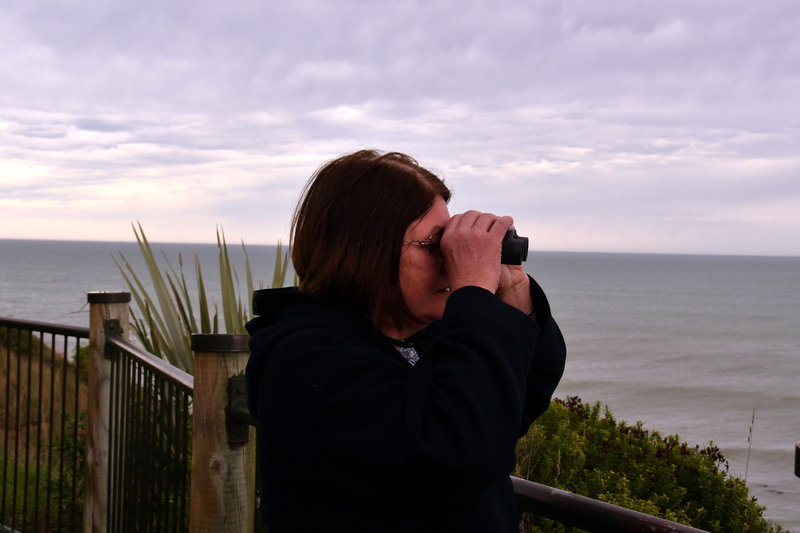 The reason for our stop is that Oamaru is the home to colonies of Blue-eyed Penguins and their Yellow-eyed cousins. Apparently they can be seen in the evenings waddling down the high street. Sadly not today and not at lunch time. We camp on the headland overlooking their supposed haunts, field glasses and cameras at the ready, but they are clearly all at sea, doing what penguins do – except for one, who stands, quite still, on the shore with his back to us. We are, however, rewarded by spotting numerous sea-lions who, waking from their day-long slumbers on the rocks, shamble clumsily into the surf to then show off their swimming and cavorting skills. We must journey on. Dunedin, our stop-over for the night, is described as a bustling university city. We check in to our hotel, stable the car and before we can venture out, the heavens open and all the rainfall of the last, fine two weeks descends upon Dunedin. Confined thus to barracks, we have another Sue-inspired room-picnic (enhanced by a very decent bottle of SB), and recline. 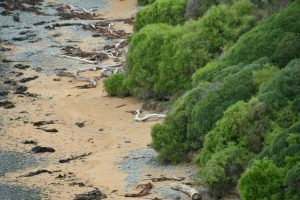 This entry was posted in New Zealand 2018 on 27 February, 2018 by David.